A friend posted a sad one on Facebook the other day. His beloved dog had to be put down. The sadness was just dripping off the few words that went along with the closeup picture of his dog’s face. I felt it in my gut. I’ve had to say goodbye to 3 pets that way, a dog and two cats. It has been said you can be a dog person or a cat person, but not both. I do like both, but if I had to choose, I’d take the dog every time. 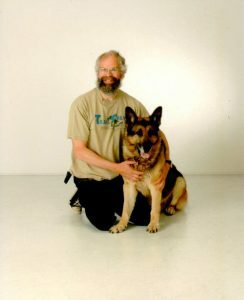 I remember the day when I had to day goodbye to our German Shepherd Panzer. The poor old guy couldn’t use his strength to lift up his rear end. The vet and our family decided it was time to end this, so that is what we did. Panzer trusted me to carry him to the table in the clinic, and we looked at each other while the vet was busy finding a vein. I put my hand by his nose, and he sniffed, knew it was me, licked my hand, and was gone. These are sad thoughts, but important ones. Panzer lived a life that had meaning for his family. We still grieve after 15 years of absence. We’ll all face a day when we can’t get up, and when that next elusive breath will be hard to catch. Did we live a life that meant something to the people around us? The time to think about it is not at the end of your life, but right now. Try to spend every day being a person that will be missed when you are gone. This entry was posted on Friday, December 15th, 2017 at 10:16 pm and is filed under Uncategorized. You can follow any responses to this entry through the RSS 2.0 feed. You can leave a response, or trackback from your own site. The only downside to having a great dog like Buddy or Panzer is the goodbye at the end. There are so many hellos to compensate us though. That wagging tail, happy eyes, tongue hanging out… dogs laugh with their whole bodies. We miss you too but know that wherever you happen to be in the world you’ll be spreading that warmth that seems endless coming from you. Best always!